• I am not a procrastinator. I am organized. I am both confident and relaxed, because I have a solid plan and a clean house. • I give thanks for Thanksgiving. I am Thanksgiving personified. I am Squanto and Miles Standish rolled into one efficient thanks-giving machine. • The grocery store is an oasis of inner peace. Standing in line is not a frustrating waste of time, but an opportunity to plan ahead for Christmas and to finally try those tea tree toothpicks. • Every moment spent in preparation is a gift to my future self. I love you, Future Self! Do you have your notebook out? Okay, let’s get focused, we have a big week! 5. Figure out how much turkey you need. 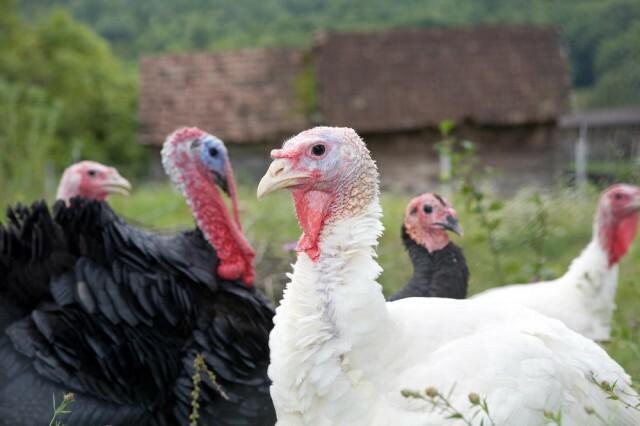 One pound per person is the traditional rule of thumb, but keep in mind that’s for a huge-breasted mass-market monster turkey, and a less beastly bird will have a different ratio of muscle to bone. Get at least 1–1/2 pounds per person. If this works out to more than 22 pounds, definitely consider getting two smaller turkeys, if you can fit them in your oven. Two eleven-pound turkeys can fit in an ordinary roasting pan (rectangle, not oval) with some rotating and flip-flopping. One added advantage to this, if you want the picture-perfect table, is that you can present a perfectly roasted whole bird in the dining room while carving (mutilating) the other one in the kitchen. Make sure you have the equipment you need to get this done, starting with the brining step. The night before Thanksgiving, you are going to need a cool, safe place to leave the turkey(s) soaking in a salt-and-sugar brine. This could be a large bucket or a cooler, but whatever you use must be clean. There are these fabulous brining bags that will help with the clean-bucket issue, but I don’t recommend just plopping a bird in a brining bag in the fridge — it still needs to be in something, such as a bucket or punch bowl, or else not enough bird will be in contact with the brine. Even though we are keeping the Thanksgiving menu as simple as possible, you may not have enough room in your refrigerator for buckets of birds in brine. In most U.S. places, it’s cold enough to leave them outside, but make sure they are protected from hungry bears, invasive deer and chupacabras. So: make sure you have the containers you need and the space you need. In your zeal for preparedness (good for you!) you can even prepare the dry ingredients for the brine now: two cups of salt, two cups of sugar, several bay leaves, and many peppercorns, to which you’ll add several smashed/peeled garlic cloves and two gallons of water when the time comes to actually do the brining. When it comes to the roasting itself, you certainly need a roasting pan — the biggest one that will fit in your oven with the door closed. It’s great if the pan comes with a rack, but that’s not absolutely necessary. Rectangular is better than oval for several reasons, including that you’re going to use the roasting pan to make gravy, and it needs to fit comfortably over two burners. Finally, you’ll need something to flip the bird over and move it around. The forks that often come included with roasting pans are to me useless. I prefer to use these silicone oven mitts; even if they are a bit messy they are washable. Let’s go ahead and add a dark colored apron to the list of mandatory equipment. Why Aren’t Dairy Farmers Richer? If you haven’t finished making pie dough and turkey stock, try to do it soon — this week’s plan doesn’t involve a lot of new kitchen work, so you can catch up on those things. If you still have butter left after making all the dough you need, it’s a good time to make some compound butter. You’ll need ¼ pound of herbed compound butter — make it with parsley, time, rosemary and lemon zest — for the turkey itself, and go ahead and make ¼ pound of black-pepper or brown-sugar butter for the table, especially for the Friday morning toast-and-omelet brunch. Now that you’re out of butter, you’ll need to replenish your supply (and to think, the Wampanoag didn’t even have butter). Butter, butter, butter! While you’re at the grocery store (or farmers market, ordering turkey) pick up some eggs, too. You’ll need more of these than you think (calculate how many for that brunch alone), and there are no problems — indeed some advantages — to keeping them in your fridge for a couple of weeks. You need to have your menu written out, and a fairly solid idea how long things take to cook. You should also know what time you want to serve the Thanksgiving meal. Make sure you know which/how many pots and pans fit on your stovetop at the same time, and what baking dishes you can fit in your oven while the turkey is in there — adjust the racks so you can test for vertical space, too. We’re going to make a chart so that we can work backward from your desired finishing time. Make columns that reflect the main constraints: your appliance resources and time points. Make a column for the oven, the microwave, and each burner on the stove. Also make a column for your serveware — it’s better to match the right bowl to the food ahead of time than to grab a wrong vessel in the heat of the moment. Gravy is the last thing you need to make, so it’s the first thing you should allocate on your chart (just to get started). Use half-hour increments, even if you think some things will be quicker — allow yourself a more flexible timeline. Fill in everything as you think of it (if you do the dry run — yes, I said dry run — you can re-order then). Keep an eye out for time points when you are doing too much at once (starting a something on the stovetop while swapping other things in and out of the oven). Find the “down” times and move non-time-sensitive tasks (e.g., cranberry sauce) to those times. If this is going to be your first time hosting Thanksgiving at your house or you are simply prone to worry, we can turn preparation up to 11 this weekend with a Dry Run. Sure, this is intense (and probably neurotic), but it has its benefits — it will allow you to relax in the certainty that everything is covered. Plus, rehearsals are fun — like putting on a play, but adding a digital timer and a glass of wine. For the dry run itself, use the actual equipment, and practice all the transitions on your timeline, including moving food from cookware into service vessels. The service step can be surprisingly time-consuming and chaos-producing, so it’s good to test the flow of things. Make adjustments as needed, and make a list of any missing equipment — get on Amazon right away so you don’t forget to order these things. A little bit of decoration is really the icing on the cake, especially since there is no actual Thanksgiving cake. Keeping in mind that your table is going to be loaded with food, you don’t need a lot of floral design. Make sure you have candles and candlesticks — tapers over votives for this occasion. Rather than the tired old gourds and maple leaves, maybe place potted orchids on the table, or a few yarn “dandelion ghosts” planted in milk bottles. I rarely buy a tablecloth at the store, because they are so unconscionably overpriced. To get something really festive for Thanksgiving, something that won’t get a lot of use, I just head to a discount fabric store and scan the sale racks, especially in upholstery. When I lived in New York I loved the Save-a-Thon up on Third Avenue, with its very cheap, often eye-popping selection. I try to go for an unexpected color or style, like faux silk in teal or lilac instead of the usual fall shades. Two or three yards are undoubtedly enough, and if the roll is wide it doesn’t even need to be hemmed, though you can hem the edges for added durability. If the roll is too narrow for your table, make a runner. Instead of sewing, just use iron-on fusing web. Oh, and while you have the iron out for that, make sure you know what you’re going to wear on Thanksgiving. Give it a press, hang it up, and keep it in the back of the closet so you don’t accidentally wear it to work. You may find something needs dry cleaning or repairs; take it to the tailor on your way to work Monday morning. Your final job for this week is to go over the guest room, guest bed, guest couch or air mattress once again to be sure everything is in working order and the linens are clean — if they’ve been in the closet since last Thanksgiving, please toss them in the drier or hang them outside for a day. Sated with food, wine and repartee into the wee hours, your guests should have no trouble sleeping, but fresh sheets will give them one last reason for a “thank you” on Thanksgiving. K. Emerson Beyer, environmentalist and gadabout, lives in Durham, N.C. and tweets as @patebrisee. Photo by Gordana Sermek, via Shutterstock.